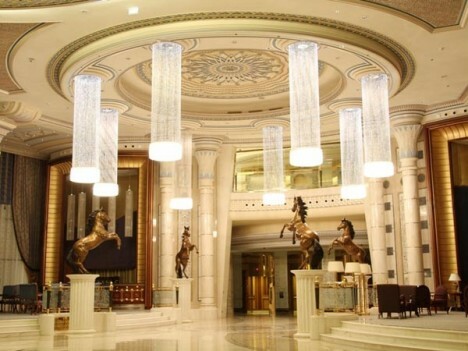 Finally Ritz Carlton one of the world's leading hotel chains open their first hotel in Saudi Arabia, as we know there's so many luxury hotels on Saudi today, as we had expected, the Ritz Carlton Hotel offers luxury stay, It has 491 rooms and suites. 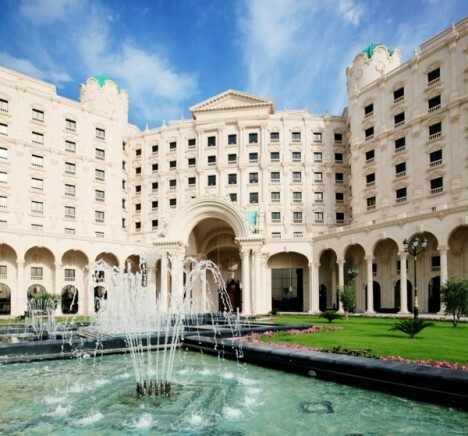 The Ritz-Carlton Hotel was opened at Riyadh on October 24. 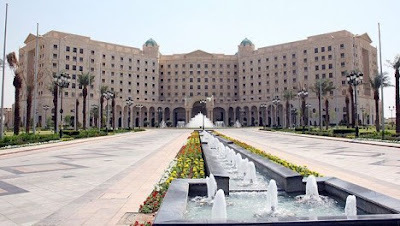 The palatial hotel is laid next to the Diplomatic Quarter and adjacent to the King Abdul Aziz Convention Center. The hotel’s stately architecture is modeled on traditional palaces with ochre facades blending gracefully with the verdant landscape of the gardens. The Hotel interior was inspired by Arabic traditions, paintings and design - is divided into two-bedroom Royal suites, two-bedroom Executive suites as well as a range of single rooms. It has a Remarkable features include 49 lavish and exquisitely appointed two-bedroom Royal Suites each measuring more than 430 square meters (4,630 square feet,) and 50 two-bedroom Executive Suites at 104 square meters (1,120 square feet). All guestrooms and suites are elegantly styled using the vibrant colors and ethnic textures of the region, with subtle touches reflecting the Kingdom’s Arabic heritage. 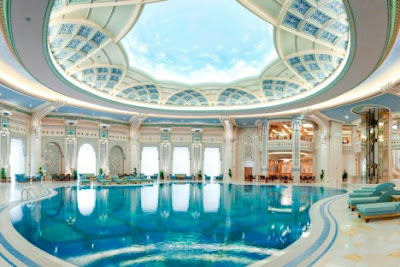 There's one amazing things about this Hotel in Riyadh, you can enjoy the luxurious indoor swimming pool here, It seems that there's not many hotels offer the luxury indoor swimming pool like this Ritz Carlton. This Hotel also surrounded by Native palms at the entrance, 600-year old olive trees from Lebanon, and water fountains abound on the property, providing an oasis of serenity amidst the city center. The Ritz-Carlton Hotel Company, LLC of Chevy Chase, Maryland, currently operates 76 hotels in the Americas, Europe, Asia, the Middle East, Africa, and the Caribbean. Here's more pictures of the First Ritz Carlton hotels in Saudi Arabia.